Manic Street Preachers, the cult rock band, will play in London tonight for the first time since their guitarist mysteriously disappeared nearly a year ago. The band had played the Astoria, in London, just before Christmas last year after a successful year during which their album The Holy Bible had made the Top 10. 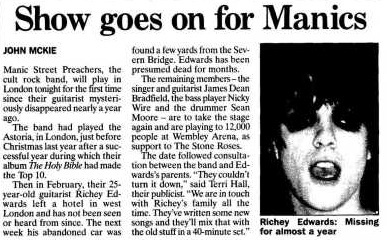 Then in February, their 25-year-old guitarist Richey Edwards left a hotel in west London and has not been seen or heard from since. The next week his abandoned car was found a few yards from the Severn Bridge. Edwards has been presumed dead for months. The remaining members - the singer and guitarist James Dean Bradfield, the bass player Nicky Wire and the drummer Sean Moore - are to take the stage again and are playing to 12,000 people at Wembley Arena, as support to The Stone Roses. The date followed consultation between the band and Edwards's parents. "They couldn't turn it down," said Terri Hall, their publicist. "We are in touch with Richey's family all the time. They've written some new songs and they'll mix that with the old stuff in a 40-minute set." This page was last modified on 15 May 2018, at 15:14.